Price: Rs. 264 on Amazon. Like most of us, I heard about this book after news spread that the movie 'Drishyam' was loosely based on this book. I absolutely loved the movie and the screenplay blew me over. I'm the one who always prefers books over movies, so I had to buy this one. After years, I walked into a book store and picked a book. Thanks to online shopping I had forgotten the thrill and satisfaction I get when I walk into a book store. Okay now about the book. Yasuko Hanaoka is a divorced single mother who stays with her daughter Misato and works in a restaurant to make a living. Her neighbor is Tetsuya Ishigami, a maths teacher who harbors feelings for her but doesn't tell her a word about it. He visits her restaurant everyday to buy a lunch box though. And by everyday, I mean days that she works there only. They live mundane lives and go about everyday with their routines. One day Yasuko is visited by her ex-husband Togashi who threatens to kill her if she doesn't give him money. A bitter fight takes place and Yasuko and Misato end up killing Togashi. Hearing the commotion Ishigami comes in to inquire and makes sense of the entire situation and offers help to Yasuko. He disposes the body and trains mother and daughter for the police interrogation that would soon come. When the body turns up and is identified as Togashi, the primary suspect is the ex-wife Yasuko. Detective Kusanagi is investigating this case and is convinced that all of Yasuko's alibis, even though sound, are manufactured. Yasuko seems to have the movie tickets that she went to the day Togashi was killed. She also has an alibi in the karaoke place she visited with Misato later that night. 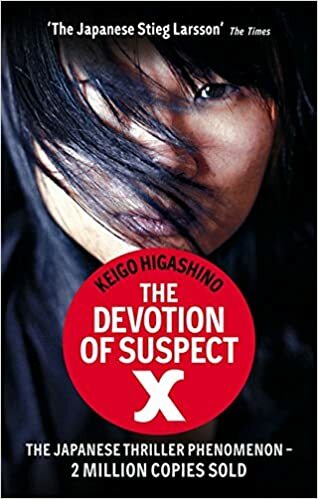 Kusanagi still smells a rat and confides in Detective Galileo aka Dr. Manabu Yukawa, a physicist and his college friend who frequently consults with the police. When Ishigami's name is revealed as the neighbor of the prime suspect, Yukawa recognizes him as his college mate who has exceptional skills in problem solving. He visits Ishigami and after a brief talk is convinced that he has something to do with the murder. A cat and mouse chase begins and Yukawa goes out of his way to prove that Ishigami is involved in the murder too. Will Ishigami break? Or will Yasuko? How long will Ishigami hold on to the love and devotion he has for Yasuko? Especially when Yasuko gets close to a male friend of hers. Will jealousy make Ishigami give her up to the cops? The ending will leave you spell bound. The writing is fairly simple with minimal characters. I like books that move fast and in this one the murder and the murderer is revealed within the first three chapters. What follows next is the cover up. The story is absolutely brilliant and the pace is just right. The silent love and devotion Ishigami has for Yasuko couldn't be shown much better. Yasuko does come across as a strong woman even though she piggy banks on Ishigami for almost everything related to the case. Kusanagi is annoying but when Yukawa comes into picture, this becomes as thrilling as it can get. Yukawa's analysis of Ishigami's plan comes in as a surprise as does the twist in the end. The writing is brilliant and there is now way you can predict anything in this story. Drishyam was a fantastic movie, but apart from the fact that this movie and the book involves a murder cover up, nothing else is similar. This book has been made into a movie too. I would be watching that really soon. Verdict: Absolutely brilliant writing and hands down the best mystery I've ever read. I remember reading this book a few years ago and absolutely loved the twist and the engaging thriller. You must check out Salvation of a Saint by the same author too! I will be reading that soon too. I loved the movie... It is one of my Favorites... Your review is making me this book on my list. Very well reviewed. Do read the book, it is worth it. I read the book for the same reasons. And like you, I thought it was mind blowing. The intellectual games were too good. Best mystery. Just finished reading Salvation of a Saint, skipped this cause i read somewhere Dhrishyam was inspired by this book. Now after reading your review, i think i should go for this one too. Drishyam is just inspired from it, the plot is completely different. Wow! Recently, I have developed an interest in psychological thrillers. Must read this one. Glad to know that it's different from Drishyam. Loved that movie.